Mythology refers to a set of legends, stories, or beliefs, especially ones that illustrate a religious or cultural tradition. Myth stories usually address the origins of a people or culture, or explain events. In many instances, myths are built around the lives of gods and goddesses. If humans were involved, they were usually larger than life with tremendous heroic prowess. While we may have worked out most of nature's occurrences, thousands of years ago, that was not the case. Why did the rivers dry up? Why did healthy crops suddenly die? In nearly every civilization, this is when creation and nature myths began to emerge and some of the earth's natural phenomena were explained in a way that made sense to the people of that time. Today, we can learn about our ancestors through the study of mythology. We discover them through creation myths, animal myths, hero myths, and more. As the categories of myths abound, so do their symbolic meanings. Let's take a look at some types of mythology. In ancient tales, animals were often given special powers. Sometimes they communed between the gods and their people. Sometimes their symbolism was meant to inspire a people to greater achievements. How the Bear Lost his Tail is a Native American tale about a deceitful fox and a vain bear, who liked to show off his long tail. One winter day, Fox told Bear to fish in a frozen section of the pond by dipping his tail in the water. After he did, Bear fell asleep and the water froze around his tail. When Fox woke him, Bear jumped up, and most of his tail came off. The legend of the phoenix exists in many cultures, including Greek, Egyptian, and Indian mythology. Usually, the phoenix is depicted as a bright eagle or similar bird and associated with the rising sun. After a long life, when a phoenix senses its time is coming to an end, it builds a funeral pyre. When the old phoenix is consumed by the fire, a new one emerges. In Australian Aboriginal mythology, The Kangaroo Gets a Pouch tells the tale of a kind momma kangaroo who saved both her son and a stray wombat from hunters. After the ordeal, the wombat told the momma kangaroo that he was the Father of all Creatures and he wanted to reward her goodness. He told her to place some bark on her stomach. Lo and behold, a pouch appeared. Now, she had a way of keeping her son, Joey, safe. 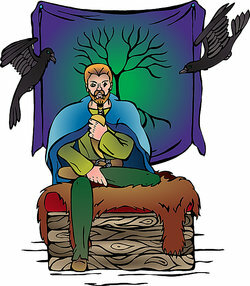 In Norse mythology, Huginn and Muninn are a pair of ravens that serve Odin and are even considered an extension of him. They fly around the world and tell him everything they see, advise him, and accompany him into battle. A Native American Seneca legend also attempted to explain why chipmunks have stripes. One day, a bear boasted to a chipmunk that he could do anything. The chipmunk asked him if he could stop the sun from rising. After the bear tried and failed, the chipmunk made fun of him. In anger, the bear pinned down the chipmunk with one paw. The chipmunk managed to squeeze free but with a new set of stripes made by the bear's claws. Creation myths didn't necessarily emerge so civilizations could provide detailed accounts of their history. They were used as a means of understanding their current condition. How did they get there? Where did this all begin? In many ways, it was easier for ancient civilizations to believe that the world was created by unseen gods or creatures, than face a series of unknown questions. The Pueblo believed they began life underground and were guided by a spirit to climb up through a hole into the Earth. Once there, they found suitable land where the gods taught them how to farm, build houses, and create communities. The Inuit believed first there were giants. Two giants had a baby named Sedna, who became so large they could no longer feed her. Because of this, they threw her into the ocean, cutting off her fingers when she tried to cling to the kayak. Each finger became a sea creature. Sedna became a powerful spirit who controlled the sea and its animals. In a Filipino myth the Children of the Limokon, the Limokon were powerful birds that could talk. On the banks of the Mayo River, they laid two eggs. These eggs became the first man and woman who married and had many children. In southern Nigeria, the Ekoi believed there were two gods in the beginning: Obassi Osaw of the sky and Obassi Nsi of the land. Osaw created the first man and woman. Nsi taught them how to survive. When they died, Nsi took them down into the earth. In Norse mythology, Odin, the father of all gods, and his brothers Vili and Ve slew the first giant Ymir and made the world out of his body and the first humans out of tree trunks. In Papago mythology, First Born came to the world when it was only darkness and water and completed the creation of the world. After he prepared the earth, I'itoi (Elder Brother) was created, then Coyote and Buzzard, and together they finished the world, its people and creatures. How did ancient people cope with destruction, death and dying? The idea of an afterlife could help rationalize life's sometimes brutal occurrences and lives suddenly cut short. Myths around the world contain an "underworld," which could be good or bad and from which a lucky few returned, symbolizing rebirth as much as death. In Norse mythology, Baldr was immune from harm, so the gods had fun throwing things at him. One day, trickster Loki gave the blind god Hodr mistletoe to throw at Baldr - the only thing that could hurt him - and he died. Baldr could return from death if everyone in the world cried for him. Only the giantess Thökk, actually Loki in disguise, refused to shed tears, so Baldr had to stay in the underworld. In Aztec mythology, Quetzalcoatl created mankind in its current incarnation, "the Fifth Sun," by journeying to Mictlan, the underworld, and using his blood to give new life to the bones of those who had lived in the previous eras. In Egyptian mythology, Ma'at was the goddess who decided who would enter the underworld. When people died, their hearts were placed on one side of a scale. The other side of the scale held Ma'at's feather of truth. If their heart was heavier than the feather, they were sent to their "second death." Hades was the ruler of the Greek underworld. Hades rarely left his kingdom but did not want to rule alone so he kidnapped Persephone to be his queen. Distraught, her mother Demeter, goddess of agriculture, let the crops die until Zeus intervened. Persephone was then destined to spend six months of the year with Hades and six months with Demeter. Hero myths are, perhaps, the most entertaining of all forms of mythology. They don't necessarily explain any natural phenomenon or major life occurrence. They might, however, illustrate admirable human traits, such as valor or morality. In these tales, a hero would be tasked with a lofty assignment. The gods would often step in, either to aid the hero or interfere and, thus, a myth was born. The most famous hero is probably Hercules (Herakles in Greek). To pay for a crime he had to complete a set of heroic tasks. He also helped the Olympians arise victorious in their battle against the giants. He was the last mortal son of Zeus, but also the only mortal to become a god upon death. Achilles was also a Greek hero. He was the son of a king and a nymph. When he was born, his mother wanted him to be immortal, so she dipped him in the river Styx. However, she was holding him by his heel, mistakenly leaving that part of his body vulnerable. Achilles went on to command legions of men in the Trojan War. He died when a poisoned arrow struck that one part of his body which remained mortal. Karna was the greatest Hindu warrior ever known. His martial arts were, indeed, epic, and he went on to conquer the entire world. He single-handedly carried out a military campaign, defeating every king in the world. Beowulf was a Scandinavian hero, immortalized in a medieval poem, a brave warrior who fought and conquered the monsters that terrorized Denmark and Sweden. He not only depicted moral virtues but also lived an adventure-filled life. Perseus is another central character in Greek mythology. He was considered the greatest Greek hero, as on an epic journey he slew Medusa and saved Andromeda from the sea monster. Indeed, life confounds every generation. One element of the human condition that never changes is our quest for knowledge. We want to know how we got here, what our purpose is, and how everything around us functions. Although we can't explain everything, we've certainly come a long way from the days when angry gods had to be appeased. Yet, mythology served an important purpose for our ancestors. It helped them make sense of the world they lived in. We can all relate to that. And mythology continues to serve an important function today. It helps us better understand the rich culture and traditions of our innovative ancestors. "Types of Mythology." YourDictionary, n.d. Web. 19 April 2019. <https://examples.yourdictionary.com/examples-of-mythology.html>.